Most Triathletes find the swim portion of the race to be the hardest, not because it is so much more physically difficult, but because it is the most unnatural. It also happens to be the most dangerous part due to the very real possibility of drowning. So, we need to know how to swim. 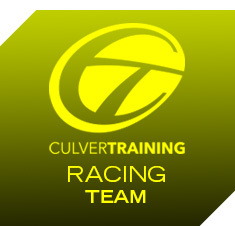 If you do not know how to swim, culvertraining© provides 1:1 instruction. Aside from that, you will need access to a pool or open water. Following the suggestions below will give you the basics on training and swim gear as well as tips on how to be successful on race day. If you are non-competitive, all the equipment you will need is a good pair of goggles, a swimsuit, and a wetsuit (not required, but it helps in dealing with the cold water and buoyancy, thus making the swim a little easier). To be more competitive, you will want to get equipment to help you get more out of your swim workouts such as a pull buoy, kickboard, and paddles (you wear these on your hands to add resistance). However, most pools have this equipment for you to borrow while you are training. KEEP IT SIMPLE: A good pair of goggles and a swimsuit made for lap swimming, not sunbathing, is really all you need for the swim portion of the event. If you do not own a wetsuit or are an inexperienced open water swimmer, select an event that is in a pool and does not require a wetsuit. If your event does require a wetsuit, and you don’t own one, some retail stores rent wet suits. Bathing caps are typically provided. Remember to practice swimming with a bathing cap. Goggle adjustment with a cap could be critical. If you have a tri-suit then the best bet is to get a number belt, and pin the number to that. Then all you have to do is twist it around to the back for the bike (most races have numbers on the bike), and front for the run. You can wear the tri-suit all the way through your race, and may not need any other clothing. Pack at lease two sets of goggles. One w/ smoked lenses if you will be swimming into the sun and one without! Decide when you get there which ones to use. You will also want to get triathlon-specific shorts that have a thin padding so that you can hop right on your bike right after the swim. It saves the time from changing to cycling clothes. The benefit of a 25 yard pool is that it is measured and you can do workouts based on distance. Once you master the basics and build a slight endurance base you will be ready to incorporate interval training into your overall season training program. Just do it and you will slowly overcome the intimidation factor. Learn to “circle swim” in crowded pools; this will only help you when you are swimming in a crowded open water triathlon. I think the single most important resource is other swimmers. Also, don’t underestimate the value of a coach. You’ll learn so much more and improve so much faster from a coach and swimming group than you will from any book or online resource. Practice Open water swimming. Pool training and racing is very different than lake or ocean training or racing! Open water has currents, waves and no lines on the ground to follow; so you end up swimming further than you think. Plan your open water swim practices incrementally. Swimming parallel to shore; then out and back; never by your self; always at a lifeguard supervised beach. A common cause of anxiety for open-water swimmers is the challenge of navigating the swim. Incorporate spotting into your training. This will build your confidence, stamina and ability to sight quickly and maintain a streamline position. Even though swims tend to be in a straight line with minimal turns, there’s no black stripe on the floor or lane markers in the lake, making it very easy to get off course. Get comfortable with the deep dark lake or ocean! Remind yourself that lifeguards and swim spotters are available to help you if needed…. Don’t panic about fish, vegetation, and debris in the water, and shark attacks are rare! You can cover a greater distance with less effort by drafting off of another swimmer. 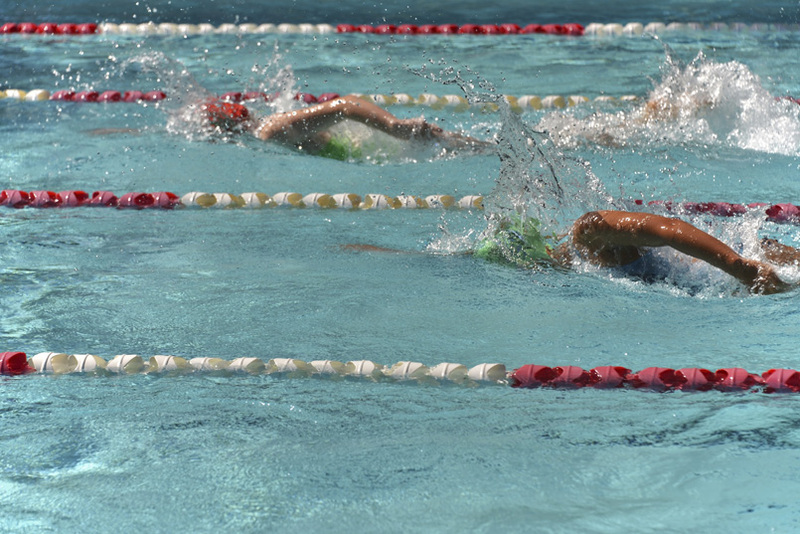 Drafting is when there is a swimmer directly in front of you or ahead of you slightly to the left or right. You get as close as you can get to them. They swim hard, breaking the way, while you swim easily in their wake. Stroke Efficiency: Keep it simple- increase your distance per stroke and the efficiency of all phases of the swimming stroke. If you don’t have a swimming background, consider working with a coach to learn techniques on elongating your stroke and making it more efficient. Proper alignment, stroke symmetry is key:Be sure that your body is aligned properly. Always start with proper head position. Incorporate bilateral breathing into your training. Your back should be relaxed, but straight from head to toe. The front end should be slightly lower than the back end, giving you the feeling of swimming slightly downhill. In addition, your shoulders should be comfortably lined up with each other. When it comes to swimming, technique trumps volume. You spend time and resources to be properly fitted to your bike and have your bike mechanically perfect; you should do the same with your swimming technique. Work with a coach to develop a personalized seasonal training program. This will provide you a methodical, motivational and enjoyable approach to training and racing. Most triathletes have the toughest time with swimming and they get in a bit over their head. Be sure you can swim the distance of your race before you participate in your first triathlon. Once you can comfortably swim 1,000 yards without rest or exhaustion, you can start to focus on actual workouts and on getting faster, but first, just get comfortable swimming. Have a plan! Triathlon swims typically swim clockwise, with large buoys marking the course to the right-hand side of the swimmers. Apprehensive swimmers may want to start in the back of the pack. Others choose to swim wide (on the outside, or left, of the pack). Know your course. Know where the turn around buoys are located and where the swim exit is and it’s relationship to your bike/transition area. Know where any landmarks are located. You may want to position yourself near the side and rear to avoid the confusion and chaos. Some like to have the buoys directly on their right-hand side so they don’t get lost. Whatever your preference, make sure you know the pros and cons of your strategy. If an extra minute or two on your swim time isn’t that big of a deal to you, it may be worth it to start in the back to keep your wits about you. When you’re surrounded by other swimmers, especially during the mass start, you’ll feel like you’re in a tsunami. The flailing of legs, arms, and water can be overwhelming, but it doesn’t have to be. Just stay focused. The chaos will subside during the first minute or two of the swim, as the pack spreads out. If you get bumped, avoid retaliation; they likely didn’t mean to bump into you, and anger and frustration will only amount to wasted energy. RELAX: While most hyperventilating people breathe into a paper bag to calm down, that strategy doesn’t exactly work in the water. However, the same principle applies. Instead of flipping on your back, stay face-down. Focus on turning your head to get a good breath of air, then stick your face in the water and focus on blowing bubbles at a steady rate. It will force you to regulate your breathing, and will take your mind off whatever it is that’s causing you to panic. When you are close to the finish, don’t stop short and breast-stroke to the exit. Swim towards the finish and don’t stop until your fingers touch the lake or ocean bottom. Swim one or two more strokes until you can push yourself up with both arms, then stand up. Give yourself a second to adjust to the change from horizontal to vertical, and exit the water running.